Why do so many people who end up in jail also suffer from a mental illness? Why do many of the same people get sent to jail repeatedly instead of getting the support and help they need? 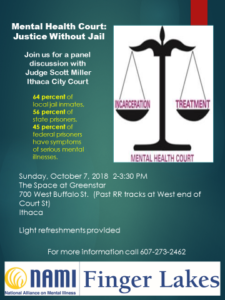 A mental health court will offer help and support to so many in our community. It is an effective alternative to incarceration. Please join us on Sunday, October 7 from 2 to 3:30 pm at The Space at Greenstar for a discussion of Mental Health Court: Justice Without Jail.